Research is an integral part of our clinical and academic mission. The members of the division are active collaborators in a variety of Canadian, North American, and international pediatric rheumatology research groups. Our research team may approach you about participating in a research study. When you are approached, you will always have the opportunity to hear about the study from a research staff member, consider a written document describing the study and what your child would be asked to do as part of the study, and ask any questions you have of the research staff member or pediatric rheumatologist. All research studies are approved by both the Children’s and Women’s Hospital Research Review and the University of British Columbia Ethics Review processes. Any participation in a research project is done with complete confidentiality of children who participate. Click here to view our current research studies that are open for recruitment. The following Rheumatology studies are ongoing, but are now closed for recruitment. Youth with JIA and their parents often have a number of concerns about moving on to adult care. Poor transition to adult care may cause negative consequences on the young adult's health. Transition support and education is a key component as children begin to mature. The Readiness for Adult Care in Rheumatology (RACER) transition questionnaire was developed by Dr. Jennifer Stinson at the Hospital for Sick Kids and other Rheumatologists, and it aims to check how prepared youth are to move on to adult care. By identifying areas of improvement through the questionnaire, the adolescents can get the appropriate resources to make the transition to adult care succesful. The PREVENT study is being headed by Dr. Dirk Foell at the University of Münster, Germany, and our pediatric rheumatology team at BCCH will be collaborators in the project. In this study, investigators will be looking at a new biomarker in the blood of children with JIA which has promise for predicting disease flares. In particular, we will be trying to determine whether this biomarker will help predict the risk of disease flare after a child with JIA is taken off medications because their disease is felt to be in clinical remission. Click here for more information on PREVENT. This study is being led by Dr. Jennifer Stinson at the Hospital for Sick Kids in Toronto, Ontario. Her team developed a web program that teaches children and families how to cope with and manage arthritis. This study will test the web program to see if it is easy to use and if the children feel less pain and have a better quality of life compared to children who do not play the game. Click here for more information on the Jointly study. In this study, we held focus groups with children with JIA and their parents to understand how they find new information on the disease. This may include the barriers they face when they seek this information, the information they feel is most important and useful to them, and their awareness and attitudes towards research. The focus groups will be conducted in other centres across Canada such as Halifax, Ottawa, Hamilton, and Vancouver. Dr. Lori Tucker is the principal investigator at BC Children's Hospital. This study is looking at the relationships between physical activity, bone and muscle development and disease activity in Juvenile Idiopathic Arthritis. LEAP is a Canada wide study with Dr. Lori Tucker as the principal investigator at BC Children's Hospital. It is also the first study to look at how active children are at different levels of disease activity. For more information, check out the LEAP website or our Facebook page! The LEAP Exercise Intervention is a pilot study headed by Dr. Lori Tucker and Dr. Kristin Houghton at BC Children's Hospital. The purpose of this exercise intervention is to determine if a home-based exercise program improves bone density and muscle mass in children and teens with juvenile idiopathic arthritis. This study is linked to the main LEAP study and will continue efforts to learn more about how to promote increased activity and well being in children and teens with JIA. Studies show that the swollen, inflamed joints seen in JIA patients may be due to the dysfunction of a certain type of white blood cell called the T regulatory cell (Treg). Tregs produce chemokines (protein signals) which attract immune cells towards them, leading to suppression of the immune response. By analyzing blood and synovial fluid, the study will examine whether this mechanism is dysfunctional in the Tregs of JIA patients and if monitoring of the mechanism could be developed into a new tool that would help predict disease remission versus disease flare. This study is led by Dr. Kimberly Morishita and Dr. Anne Pesenacker. Headed by Dr. Kimberly Morishita, CP in sJIA is a study that examines heart and lung symptoms in children with systemic juvenile idiopathic arthritis. Children with sJIA are often affected by symptoms involving other organ systems in addition to their joints. The study hopes to determine the frequency of heart/lung symptoms in children with sJIA, and determine whether these symptoms are a result of disease or a side effect of medication. Results from this study may lead to regular screening for heart and lung abnormalities in children with sJIA. Teens Taking Charge is a randomized controlled trial to study a new online self-management and educational program for teens with JIA. As JIA affects teens’ quality of life, such as their physical health, or relationship with their friends and family, the purpose of Teens Taking Charge is to determine if this online support program make a difference to teens diagnosed with JIA. The Pediatric Rheumatology team at BCCH is collaborating in this study with other pediatric rheumatology centers across Canada. Click here for more information on Teens Taking Charge. The ReACCh-Out Study is a Canada wide study, headed by Dr. Lori Tucker at BC Children’s Hospital, of newly diagnosed children and teens with JIA, researching patients’ quality of life and disease course. The purpose of the ReACCh-Out study is to gain more knowledge about JIA and how it affects patients and their families, the best treatments for JIA and the how JIA is most likely to progress. Over the five years of the study, 1,500 children and teens with JIA have been enrolled across Canada, and long term follow-up is underway. What matters the most for parents, patients and clinicians in predicting the course of Juvenile Idiopathic Arthritis? Focus groups at multiple sites across Canada were conducted to try and determine the most important information about Juvenile Idiopathic Arthritis for patients and their families when they were first diagnosed. Focus groups of patients, parents, Rheumatologist and allied health care professional were done at several sites across Canada. The information gained will help guide development of prediction tools for outcomes in JIA, as well as possibly guide national research agendas. The purpose this study is try and identify better ways to measure and monitor kidney disease activity and damage in children and teens with SLE across Canada and the United States. In this study, researchers are looking at whether new biomarkers in the urine that seem to be predictive of kidney disease in SLE correlate with specific types of abnormalities seen on kidney biopsies, a common test done when patients with lupus develop kidney problems. The SLED study includes patients with SLE and Type I Diabetes (recruited by the Division of Endocrinology). The purpose of the SLED study is to better understand what causes SLE and to identify biomarkers that could help monitor and treat SLE. Blood samples are collected from all new patients with SLE, at time of diagnosis and over various time points, to be used by collaborating immunology researchers at BCCH who work with the Pediatric Rheumatology team. The ARCHIVE Study is researching the differences between adult and pediatric vasculitis and the length of time it takes doctors to diagnose pediatric vasculitis. The ARCHIVE Study is a study that examines the clinical information of children with chronic vasculitis from Canada and the United States. Dr. David Cabral is the principal investigator for BC Children’s Hospital. BrainWorks is an international study of children and teens with CNS (central nervous system) vasculitis, an inflammatory brain disease. Dr. David Cabral is the principal investigator for BC Children’s Hospital. The goal of the BrainWorks study is to create a new classification system for CNS vasculitis by characterizing patient’s symptoms at the time the disease first presents. For more information visit the BrainWorks website! The Canakinumab drug study is for patients diagnosed with Systemic Juvenile Idiopathic Arthritis (sJIA). The purpose of this drug study is to see if Canakinumab is safe and effective in the treatment of sJIA. The purpose of this clinical trial is to determine how safe and effective Canakinumab is in treating children with hereditary periodic fevers compared to placebo. Placebo is a drug that looks like Canakinumab but has no active ingredients. The STOPP study is a Canada wide study looking at the effects of steroids on bone health in children and teens. Participants in this study have rheumatic conditions and being treated with oral or intravenous (IV) steroids as part of their regular treatment. YHES! is a Canada wide study for young adults with Systemic Lupus Erythematosus (SLE) and Juvenile Idiopathic Arthritis. The goal of the YHES! study is to discover the experiences young adults with these chronic conditions have finding and maintaining employment. Youth in the Young Adults with Rheumatic Diseases (YARD) Clinic here in Vancouver were asked to participate in this online survey study. For more information please go to the YHES! website: www.yhes.ca. The Rheumatology team conducted a survey of all parents and patients to find out more about their experiences in the Pediatric Rheumatology Clinic. The survey project was led by Jenny Tekano, RN and Dr. Lori Tucker. We believe the results will help guide changes and improvements to care in our clinics that align with the needs of children and their parents. Here are our recent publications and reports. Chiruvanji S, Rai SKC, Lyons C, Gardiner J, Guzman J, Petty RE, Documentation of response to treatment of anterior Uveitis with juvenile idiopathic arthritis and isolated chronic idiopathic uveitis. Submitted. Houghton K, Guzman J. Evaluation of static and dynamic postural balance in children with juvenile idiopathic arthritis. Accepted for publication in Pediatric Physical Therapy. Houghton K. Physical Activity, Physical Fitness, and Exercise Therapy in Children with Juvenile Idiopathic Arthritis. The Physician and Sportsmedicine 2012 :40(3). Leblanc CM, Lang B, Bencivenga A, Chet aille AL, Dancey P, Dent P, Miettunen P,Oen K, Rosenberg A, Roth J, Scuccimarri R, Tse SM, Benseler S, Cabral DA,Campillo S, Chédeville G, Duffy CM, Duffy KW, Haddad E, Huber AM, Laxer R, Levy D, Johnson N, Ramsey S, Shiff N, Schmeling H, Schneider R, Stringer E, Yeung RS, Tucker LB. Access to biologic therapies in Canada for children with juvenile idiopathic arthritis. The Journal of Rheumatology. 2012 Sep;39(9):1875-9. Stinson JN, Feldman BM, Duffy CM, Huber AM, Tucker LB, McGrath PJ, Tse SM, Hetherington R, Spiegel LR, Campillo S, Benseler S, Gill N, White ME, Baker N, Vijenthira A. Jointly managing arthritis: Information needs of children with juvenile idiopathic arthritis (JIA) and their parents. Journal of Child Health Care. 2012 Jun;16(2):124-40. Alqanatish JT, Petty RE, Houghton KM, Guzman J, Tucker LB, Cabral DA, Cairns RA. Infrapatellar bursitis in children with juvenile idiopathic arthritis: a case series. Clinical Rheumatology 2011; doi:10.1007/s10067-010-1620-2. Telio D, Pi D, Zalunardo N, Tucker LB, Chen LY. Atypical autoimmune hemolytic anemia. Haematologica. 2011 Nov;96(11):e43. Levy DM, Peschken CA, Tucker LB, Chedeville G, Huber AM, Pope JE, Canadian Network for Improved Outcomes in SLE (CaNIOS) 1000 Faces Investigators, Silverman ED. The 1000 Canadian Faces of lupus: Influence of ethnicity on disease in the pediatric cohort. Arthritis Care & Research 2012 June 28. Brunner HI, Mina R, Pilkington C, Beresford M, Reiff A, Levy D, Tucker L, Eberhard A, Ravelli A, Schanberg L, Saad-Magalhaes C, Higgins G, Onel K, Singer N, von Scheven E, Itert L, Klein-Gitelman M, Punaro L, Ying Y, Giannini EH. Preliminary criteria for global flares in childhood-onset systemic lupus erythematosus. Arthritis Care & Research, 2011; Sep;63(9):1213-23. Morishita K, Guzman J, Chira P, Muscal E, Zeft A, Klein-Gitelman M, et al. .. and Cabral DA. Do Adult Disease Severity Subclassifications Predict Use of Cyclophosphamide in Children with ANCA-associated Vasculitis? An Analysis of ARChiVe Study Treatment Decisions. The Journal of Rheumatology 2012;39:2012-2020. Twilt M, Benseler S, Cabral D. Granulomatosis with polyangiitis in Childhood. Current Rheumatology Reports 2012; 14(2):107-115. Dolezalova P, Price-Kuehne FE, Ozen S, Benseler SM, Cabral DA, Anton J, et al. Disease activity assessment in childhood vasculitis: development and preliminary validation of the Paediatric Vasculitis Activity Score (PVAS). Annals of the Rheumatic Disease 2012 Oct 25. Uribe AG, Huber AM, Kim S, O’Neil KM, Wahezi DM, Abramson L et al....and Cabral DA. Increased sensitivity of the EMA algorithm for the classification of childhood granulomatosis with polyangiitis (Wegener’s Granulomatosis). The Journal of Rheumatology 2012 Aug;39(8):1687-97. Morishita K, Li SC, Muscal E, Spalding S, Guzman J, Uribe AG et al....and Cabral DA. Assessing the performance of the Birmingham Vasculitis Activity Score (BVAS v.3) at diagnosis for children with ANCA-associated vasculitis (AAV) in A Registry for Childhood Vasculitis (ARChiVe). The Journal of Rheumatology 2012 May;39(5):1088-94. Luqmani R, Suppiah R, Edwards CJ, Phillip R , Maskell J, Culliford D, Jayne D , Morishita K, Arden N. Mortality in Wegener's granulomatosis: a bimodal pattern. Rheumatology (Oxford) 2011 Apr;50(4):697-702. Morishita KA, Rosendahl K, Brogan PA. Familial Takayasu arteritis - a pediatric case and a review of the literature. Pediatric Rheumatology Online Journal 2011 Feb 2;9:6. Houghton KM, Emery CA. Bodychecking in Youth Ice Hockey. Canadian Pediatric Society Position statement. Paediatrics and Child Health 2012;17(9). Petty RE. Paediatric rheumatology. What has changed in last 10 years? Indian Journal of Rheumatology (Suppl) 2012;7:1-2. Rodd C, Lang B, Ramsay T, Alos N, Huber AM, Cabral DA, Scuccimarri R, Miettunen PM, Roth J, Atkinson SA, Couch R, Cummings EA, Dent PB, Ellsworth J, Hay J, Houghton K, Jurencak R, Larche M, LeBlanc C, Oen K, Saint-Cyr C, Stein R, Stephure D, Taback S, Lentle B, Matzinger M, Shenouda N, Moher D, Rauch F, Siminoski K, Ward LM and members of the Canadian Steroid-Associated Osteoporosis in the Pediatric Population (STOPP) Consortium (A Pan Canadian Pediatric Bone Health Working Group). Incident vertebral fractures among children with rheumatic disorders 12 months after glucocorticoid initiation: a national observational study. Arthritis Care & Research 2012; 64(1): 122-131. Alos N, Grant RM, Ramsay T, Halton J, Cummings EA, Miettunen PM, Cabral DA et al. High Incidence of Vertebral Fractures in Children With Acute Lymphoblastic Leukemia 12 Months After the Initiation of Therapy. Journal of Clinical Oncology 2012 Aug 1;30(22):2760-7. Shiff NJ, Brant Rollin, Guzman J, Cabral DA, Huber AM, Miettunen P, Roth J, Scuccimarri R, Alos N, Atkinson S, Collet JP, Couch R, Cummings E, Dent P, Ellsworth J, Hay J, Houghton K, Jurencak R, Lang B, Larche M, LeBlanc C, Rodd C, St. Cyr C, Stein R, Stephure D, Taback S, Rauch F, Ward L and the Canadian STOPP Consortium. Glucocorticoid-related changes in body mass index among children and adolescents with rheumatic disease. Arthritis Care & Research (Hoboken) 2012 Jul 23. Kennedy JM, Foster GE, Koehle MS, Potts JE, Sandor GGS, Potts MT, Houghton K, Henderson WR, Sheel AW. Exercise-induced intrapulmonary arteriovenous shunt in healthy women. Respiratory Physiology & Neurobiology. 2012 Apr 15;181(1):8-13. Woo P, Petty RE. Significant developments in Paediatric Rheumatology in the last 50 years. Rheumatology (Oxford) 2011;50:1533-6. Alqanatish JT, Houghton KM, Cairns RA. Childhood osseous sarcoidosis presenting with headache and lytic skull lesions. Journal of Clinical Rheumatology 2011;17(8). The Rheumatology Research Report is a quarterly newsletter published by the team. 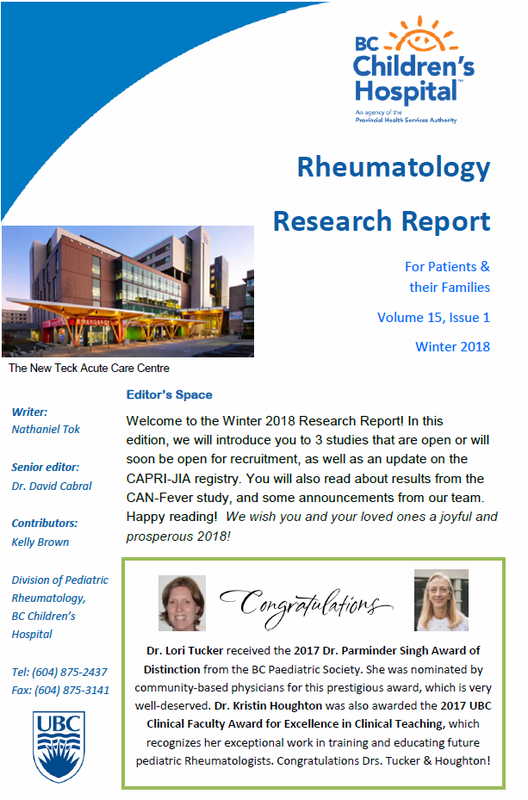 It contains study updates, introductions to new studies, information on active studies, results, FAQs about rheumatic diseases, and Rheumatology team announcements.